Watering is the most challenging part when growing Haworthias. A problematic watering schedule can damage many plants at once due to the rots caused by excess water in the growing medium. The temperature should be the main consideration to decide when to water and how much water to supply. 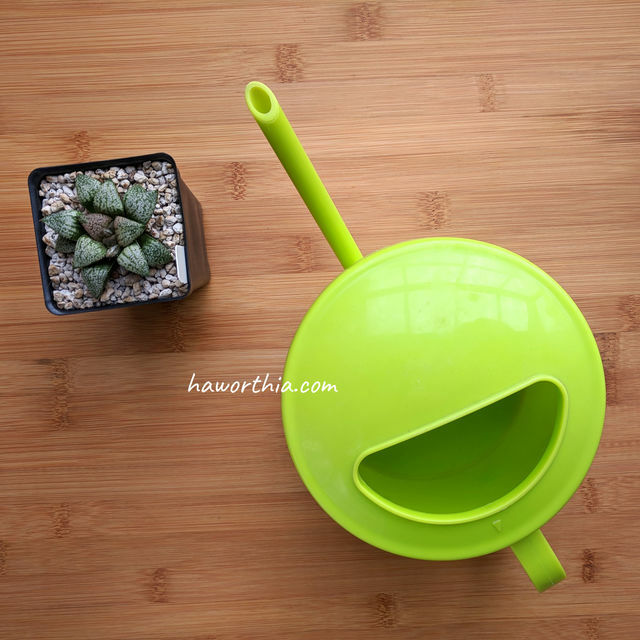 A watering can with a narrow spout gives more control of water. 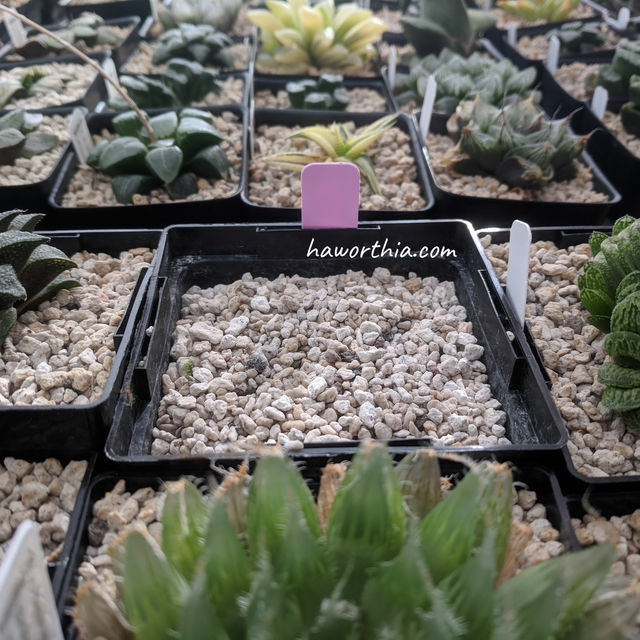 Haworthias start growing in autumn and slows down during the coldest part of winter (when the daytime temperature is below 7 ºC) and pick up growth rate again during the early part of spring before shutting down for dormancy during summer (when the night-time temperature is above 33 ºC). When a plant is actively growing, a general rule is to wait until the growing medium around the roots is dry before rewatering. On the other hand, when a plant is less active due to a hot or cold temperature, the amount of water supply should be reduced and even stopped. The best time of day to water is early morning in a relatively cold weather and late afternoon or evening in a relatively hot weather. The goal is to ensure the temperature stays moderate (15~25 ºC) for several hours after watering. A low temperature slows down the evaporation of the excess water, and a high temperature increases the activities of pathogens. They both can lead to rot. Experienced growers can tell if the growing medium is approaching dryness from the weights of containers. A beginner’s method is to fill an empty container with the growing medium and water it with other plants, When needed, take out the growing medium and check its moisture level. During the growth periods and with a well-drained growing medium, water a plant from the top until ~20% of the water applied exits the drain. This flushing process prevents salts carried by fertilizers and water from accumulating in the growing medium. The salts can inhibit the water and the nutrient uptakes of a plant. The bottom-up ‘soaking’ approach is not recommended because it is less efficient at taking salts away. When plants are off the growth periods, to reduce the water supply, a good method to only water at one edge or corner of a container. When the weather becomes more extreme, it is recommended to only occasionally spray during hours with a moderate temperature. It is fine to wet plants during watering. However, pay attention when using tap water because it can contain high mineral content and leave water stains on leaves. In this case, distilled water or filtered water (for example, reverse osmosis water) can be used instead. Acidifying the water often solves this problem too.